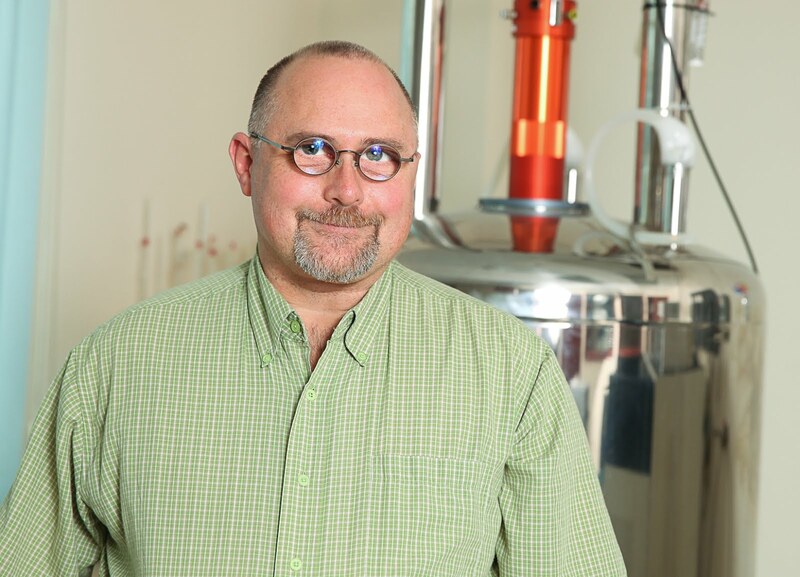 A blog for the NMR users at the University of Ottawa and all others interested in NMR spectroscopy. Please feel free to make suggestions for future posts by emailing Glenn Facey. Many people use statements like, "It is fast on the NMR time scale" without really having an understanding of what the "NMR time scale" means. Assume we have a compound with two inter-convertible conformations, A and B, each of which gives a different NMR spectrum. If the interconversion between A and B is very slow then we expect to get a spectrum with both conformations A and B resolved. If the interconversion is very fast then we would get an unresolved spectrum which represents the average conformation of A and B. The interconversion between A and B is fast on the NMR time scale if it occurs at a rate much greater than the difference in frequency between A and B. Since the difference in frequency between A and B depends on the Larmor frequency of the nucleus being observed and the strength of the magnetic field, the "NMR time scale" depends on the particular experiment and the field strength. Therefore, when one uses the expression, "NMR time scale" one must qualify it with details of the measurement. 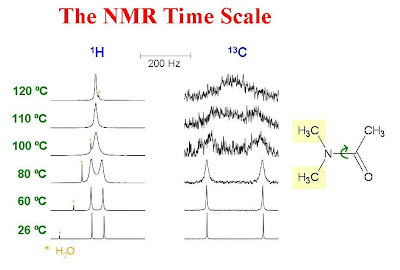 An example of different NMR time scales is shown in the figure below. Here the 1H (300 MHz) and 13C (75 MHz) NMR spectra of the N-methyl groups of N,N-dimethylacetamide are shown at various temperatures. The spectra were plotted on the same scale in Hz. In this molecule there is a hindered rotation about the central C-N bond. One can see that the rotation is fast on the 1H NMR time scale before it is fast on the 13C NMR time scale because the difference in frequency between the methyl groups is smaller in the 1H spectrum compared to the 13C spectrum. I have an examination in NMR spectroscopy tomorrow. Your explanation was very useful and clarified the meaning of the term 'NMR time scale'! I'm so greatful!!! Still I did not understand.In general it is okey. Which parameter indicates the the NMR time scale? AQ:Aacquisition time, pulse duration (P1) or what?? It is whether or not the frequency difference between the reonances is comparable to the frequency of interconversion between A and B. No you cannot say that the jump rate is 20 times per second. You can however say that it is much slower than 20 times per second. You can however get an estimate of the jump rate at the coalescence temperature. The problem with anonymous on March 5, 2010 is that he/she probably did not understand why we see a single peak in an exchange situation. The single peak represents neither of the conformations A and B, rather it is an weighted average of the resonance frequencies of the two (this should be clear from the figure shown). Actually a nuclei attached to any anisotropic molecule feels different extent of the applied magnetic field at different orientations relative to the field direction and hence resonate at different frequencies. In the liquid (and gaseous) state where the rate of tumbling of the the molecule is very high (of the order of THz) we see a single sharp line, which represent an average resonance frequency from all possible orientations. There are still some things that are unclear to me. What is the time scale if you see only a single peak (say in metal)? I have people refer to the timescale being the inverse of the larmor frequency. Is that true? To follow up on what I asked before, I want to clarify that I was asking what the NMR time scale is if there is no interconversion. When one refers to a time scale relative to the inverse of the Larmor frequency, one is usually talking about relaxation processes as T1 and T2 depend on spectral density functions which have minima close to the reciprocal of the product of the Larmor frequency and a motional correlation time. When there is no interconversion the concept of an NMR time scale as described in this post has no real meaning except that the conversion is infinitely slow on the NMR time scale. Say, the 7Li NMR spectra has FWHM of 10kHz. can I estimate jump rate from spectral width ? if yes, can you explain me how ? 7Li is quadrupolar and the line width may be broadened due to fast relaxation in addition to any effects due to exchange. As a result, I don't think you can extract an exchange rate directly from the width of the signal. What Does an RF Pulse Actually Look Like?